Former Shades Hotel in Hartlepool's Church Street. Emergency structural repairs to a prominent Church Street building will prevent future regeneration being harmed and further money being spent, council bosses stated. It came as Hartlepool Borough Council’s Finance and Policy Committee approved plans to spend £60,000 to fund structural repairs at 16 Church Street, the site of the derelict Shades Hotel. 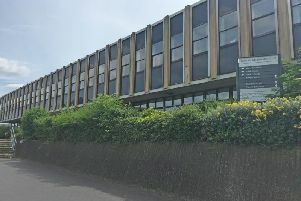 Coun Leisa Smith questioned whether they should be spending the money on the project given the council’s financial struggles, having recently approved plans to use reserves and increase council tax to ensure a balanced budget for 2019/20. However Denise Ogden, the council’s director of regeneration, said if the money is not spent now the cost will rise to ‘six figures’ and could harm a bid for Heritage Lottery Funding to regenerate the building. Coun Leisa Smith said: “I know it’s needed, but I don’t believe it should be done at the moment, we don’t have enough money to be able to deal with anything else. The money comes after the council approved allocating £128,000 in May last year to support businesses in Church Square impacted by the regeneration by implementing a support grant scheme. However after contact with businesses and site visits, only £58,000 has been allocated for grant support, leaving £70,000 to be reallocated, the majority of which is to be used on the Shades site repairs. Ms Ogden said: “If we don’t do it now it could be hundreds of thousands of pounds. “If we don’t do it, it could fall into disrepair and costs will be significantly higher. It’s urgent structural works, it’s emergency works. “This money was already allocated to properties in Church Street, it’s ring-fenced for that area, what we’re doing is investing it in that area, it’s not as if we’re taking money from another service. She added the Heritage Lottery Fund application will likely be submitted in the summer for a ‘seven figure sum’ to look to regenerate the building. Coun Stephen Akers-Belcher also backed the plans, stating the Shades site is a key building in the area. He said: “It’s a criminal offence to let a building of that kind actually fall into disrepair, so we have an obligation to do this by law. “I think it’s the right thing to do, although I understand the anxiety and concerns around the money, this is an opportunity to save a historic building. “People have been quite concerned about that building, it’s a significant building in the town, it’s an area where there has been an outcry about the potential loss of that building.